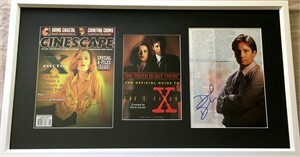 1996 Cinescape magazine cover and inside photo autographed in black and blue Sharpie, respectively, by X-Files stars Gillian Anderson and David Duchovny, professionally matted in black with Official Guide to the X-Files book cover and framed with glass in white wood, ready to hang. 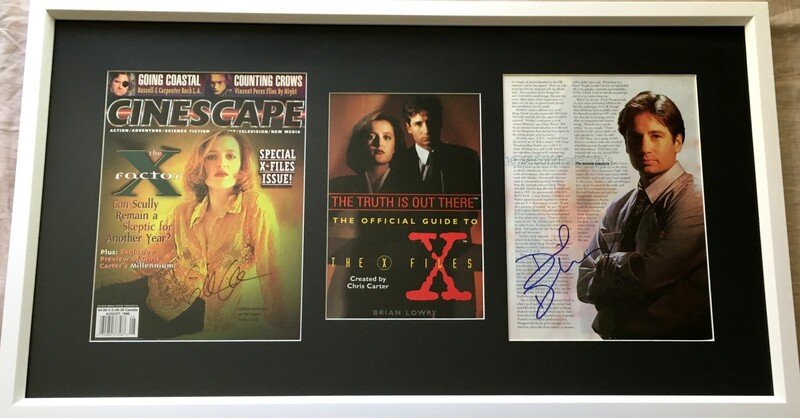 Both autographs obtained in person, with photo from the Gillian Anderson signing at 2013 Comic-Con and certificate of authenticity from AutographsForSale.com. Framed size is about 16 by 29 inches. ONLY ONE AVAILABLE FOR SALE.